A bright red colored apple speckled with tan spots that has a slight green to yellowish background. With a white flesh that is crisp textured, the Melrose provides a sweet but slightly tart flavor. 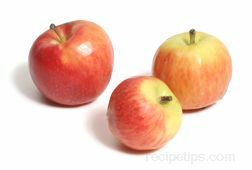 It is a good eating apple and works well as a fresh apple in salads, pies and applesauce.